First hunters warm up with some clay shooting and a thorough review of the safety procedures. Now it’s time to hunt. The quality of any bird hunting experience is determined by many factors – the fields and their cover, the birds, the knowledge and experience of the guides and perhaps most importantly the quality and training of the dogs. 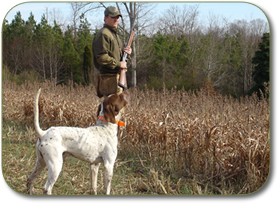 At Poplar Springs Farm we take great pride in providing the very best hunting environment combined with expertly trained English Pointers, Setters and Brittany Spaniels. It is a thrill to watch these dogs race through carefully planted fields, locate a covey of quail and contain their enthusiasm as they hold a point as if hypnotized. Flush the birds, test your shooting skills and the dogs will retrieve them to you. They ask only for a pat on the head. If you prefer you can bring your own dogs or have us train them for you. We can structure a hunting experience that works for you.